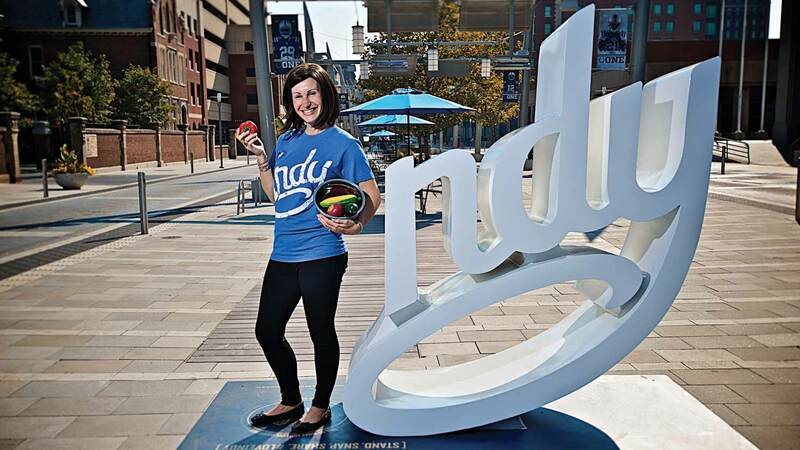 Lisa serves as Senior Communications Manager, Conventions & Meetings for Visit Indy. 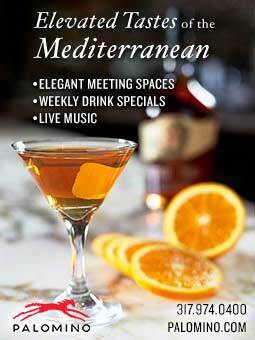 I’ve always been a fan of Spoke & Steele’s vibe, décor, cocktails, and menu. There’s now a new reason to fall in love with the food all over again. Accomplished Indy chef and restaurateur Greg Hardesty has come on board to revamp the modern American fare and truly make Spoke & Steele a neighborhood restaurant. “Greg is the godfather of neighborhood restaurants in this city,” said Chris Ratay, General Manager at the Le Meridien Hotel, of which the restaurant is (kind of) a part of. 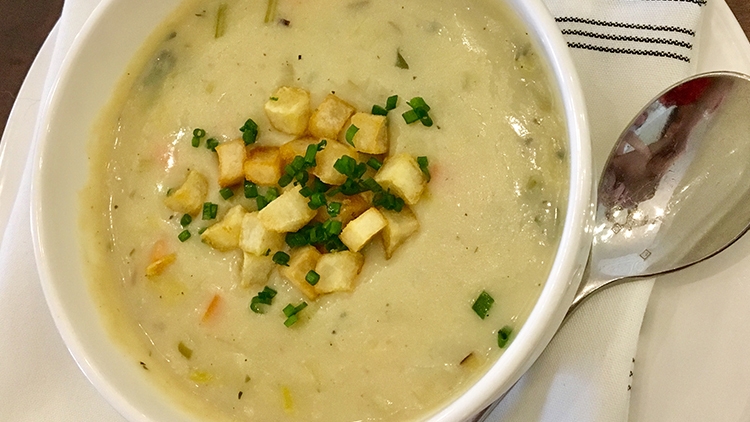 While warming up with delicious potato leek soup, a new vegetarian addition to the menu thanks to the influence of vegetarian General Manager Emily Nicoson, it was fun to learn that Greg always had an affinity for the Spoke & Steele space. 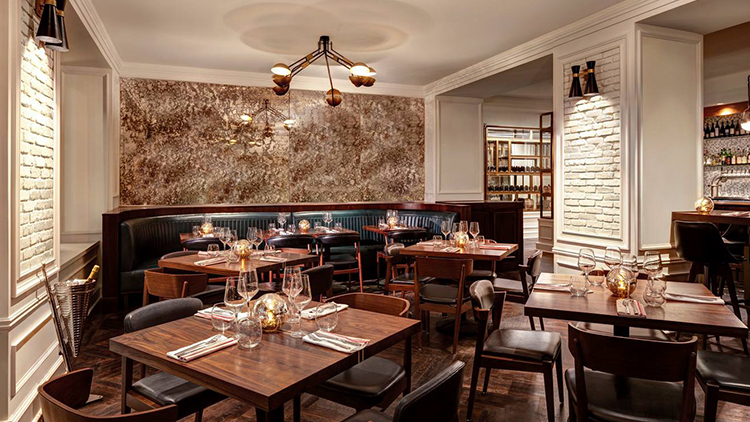 As an aspiring chef at the nearby Omni Severin Hotel decades ago, he loved the potential of designing a restaurant concept for the space in what was then The Canterbury Hotel. Turns out, he loved it so much he proposed to his high school sweetheart and now wife there 26 years ago. Back to the soup – because Greg’s take on this comfort food is worthy of a few more words – a little turnip gives it an earthy quality and pureed potato adds creaminess without reverting to an all cream base. But the veteran chef attributes the success of the dish to the precise chopping of the vegetables. It all comes together very nicely and is perfectly timed for these frigid temps. 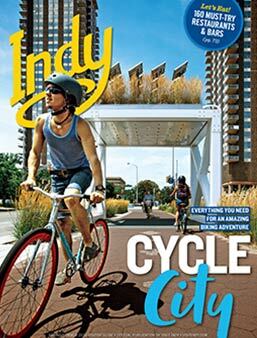 What Mass Ave and Fountain Square have done for Indy’s food scene as a whole, Spoke & Steele is looking to do for downtown’s central business and convention district – quality, locally sourced fare under the direction of a known and respected chef. To entice the lunch crowd, the first dish Greg introduced was a new Spoke Burger. Lowering the price without abandoning the quality makes it more approachable. A special Fischer Farms blend of chuck, short rib, and brisket is topped with American and sharp cheddar, roasted tomato, shredded lettuce, a special caper-tartar-mayo, and finished with a blend of three mustards. I don’t know why shredded lettuce on a burger is so much better, but it just is. Amelia’s brioche keeps it all together, and malt fries round it out. 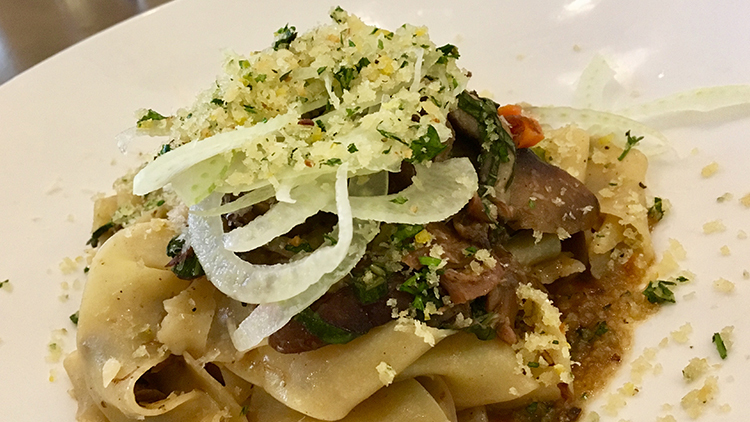 The second new entrée Greg introduced was Braised Beef & Noodles, with the two named ingredients sourced locally from Fischer Farms and Nicole Taylor’s Pasta. The thick noodles and hearty portion of tender beef shank is finished off with fennel and Parmesan. Satisfying, but you won’t feel like you’ll need to roll out the door. These dishes, along with a revamped salmon dish, will debut together during Devour Indy now through February 4. For the cocktail connoisseurs and mid-century modern fans who have come to love Spoke & Steele for such reasons – nothing is changing. But I encourage you to give the menu another look.